FEMINISM/POLITICS - Shirley Chisholm (November 30th 1924 – January 3rd 2005), an advocate for women and people of color, was the first Black woman in the United States Congress, being elected to Brooklyn’s 12th Congressional District of the House in 1968. As a Congresswoman she represented New York's 12th Congressional District for seven terms from 1969 to 1983. In 1972 she became the first African-American and one of the first women to run for the presidential nomination for a major party. She won 28 delegates but didn’t win the Democratic nomination. 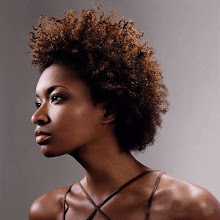 She was also a founding member of the Congressional Black Caucus and NOW (the National Organization of Women). 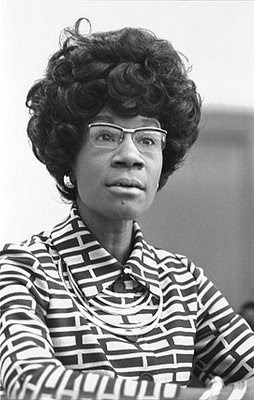 Chisholm also worked on a bill that gave domestic workers the right to a minimum wage, worked to improve opportunities for inner-city residents, a vocal opponent of the Vietnam War draft and supported spending increases for education, health care, a variety of social services, and reductions in military spending. She retired in 1982 and after leaving Congress Chisholm taught at Mount Holyoke College in South Hadley, Massachusetts for four years and gave public lectures on a variety of causes. 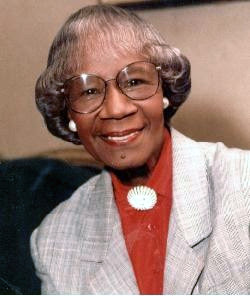 Chisholm wrote two books, Unbought and Unbossed (1970) and The Good Fight (1973). A documentary (Shirley Chisholm '72: Unbought and Unbossed) about her life and her 1972 presidential nomination was aired in February 2005 just weeks after her death.